A friend of mine has been baking the most gorgeous sourdough bread for a few years. 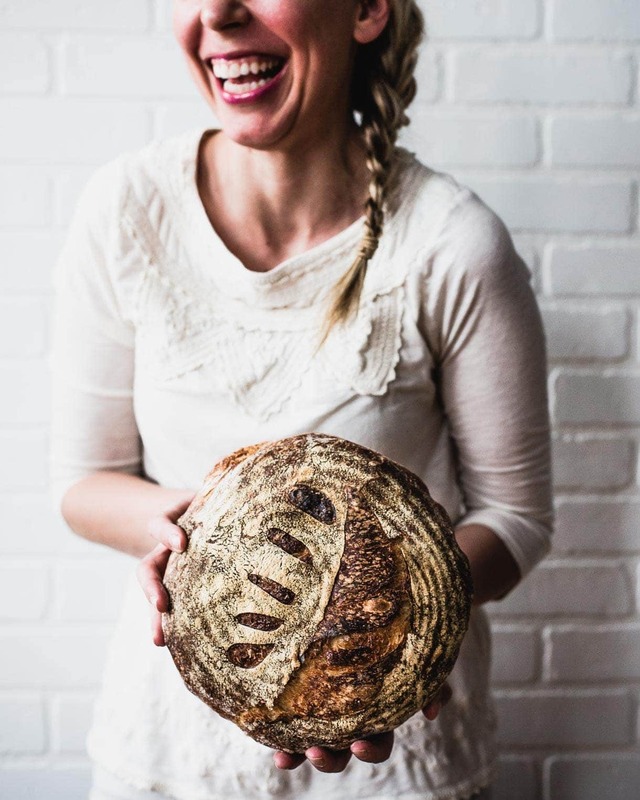 Her Instagram photos of the fresh loaves with beautiful scores drew a gasp out of me every time I saw them, wishing I could have a slice, but knowing my gluten intolerance would think otherwise. 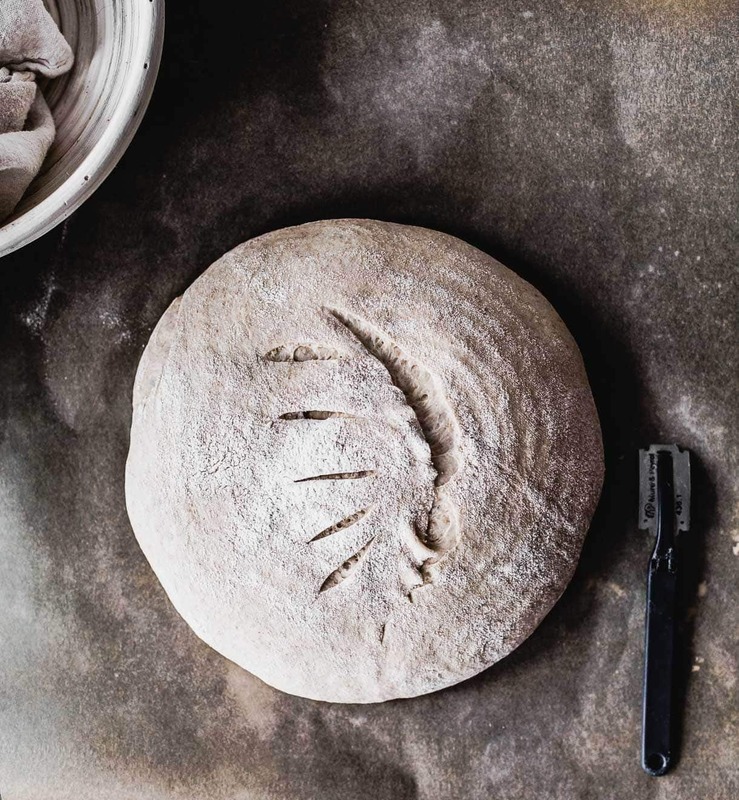 Last summer she gifted Brian a loaf, and mentioned maybe I should give it a try, since the sourdough process happens through a long, natural fermentation, and she uses single source, high quality wheat. I did a little research myself and found hope in several reports, especially one by Michael Pollan, stating that sourdough fermentation allows bacteria to fully break down the carbohydrates and gluten in bread, making it easier to digest and releasing the nutrients within it, allowing our bodies to more easily absorb them. The curiosity in me resulted in slicing a piece and going for it…. to realize that I had ZERO symptoms or gluten reaction. Two weeks later I was in Canada and tried again to make sure it wasn’t a fluke, eating red fife wheat + spelt sourdough, and I felt great. And happy. So happy to have real bread in my life again. It was a breakthrough, life changing in fact. To think that not only could I eat sourdough, but also explore the practice of bread making. However, I was intimidated to start. I’d heard stories of traveling with a sourdough starter to keep it alive, flour/water ratios, scientific baking words that I had no clue about, oven techniques, etc. Whoa. I figured it was a worth a try though, feeling fortunate that my body could handle bread made this way. So I ordered Artisan Sourdough Made Simple by Emilie Raffa, because it says simple ☺️, and started reading The Perfect Loaf blog. I felt a little bit like I was back in college, gleaning as much knowledge as I could. Emilie sent me some of her starter in a dried out form, to rehydrate and start feeding. Less than a week later I had a bubbly mixture of flour and water, rising and falling naturally. The time came to make my first loaf, and although I felt unsure the whole time, it WORKED! I was shocked, fascinated, and hooked. Although I felt like I “studied” hard before baking my first loaf, there were things I wish I would have known before starting. 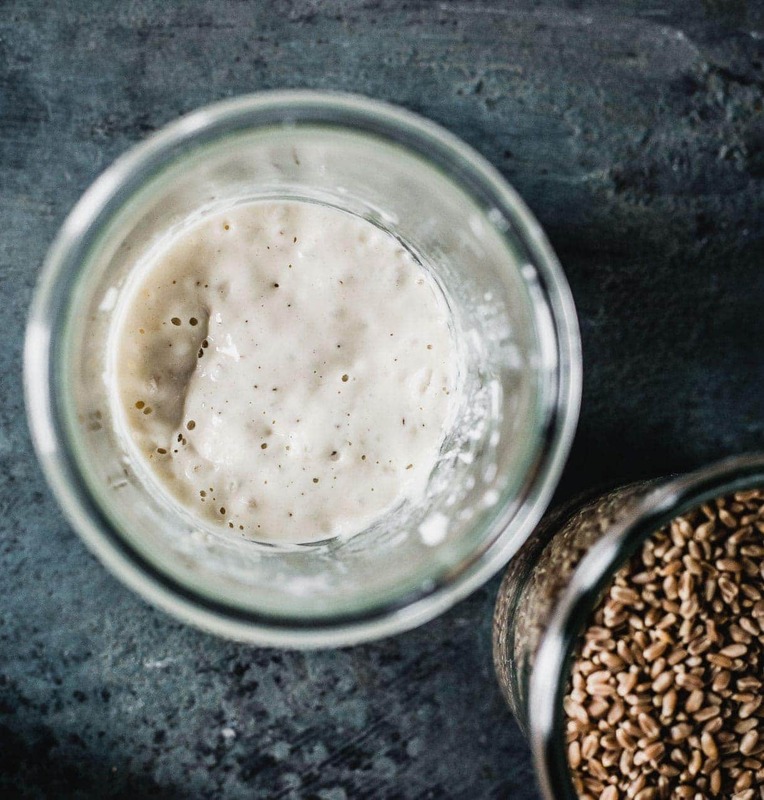 I’m writing this post today to share the top 5 sourdough starter tips, answer the most common questions I’ve received, and hopefully squash your fears of sourdough baking. Because I firmly believe that anyone can do it! You don’t need to have years of baking experience, nor understand scientific terms. You don’t need an abundance of cooking tools or a special oven. All you need is flour, water, and salt…. they do all the work for you. Isn’t that crazy? 1. How do you “start” a sourdough starter? 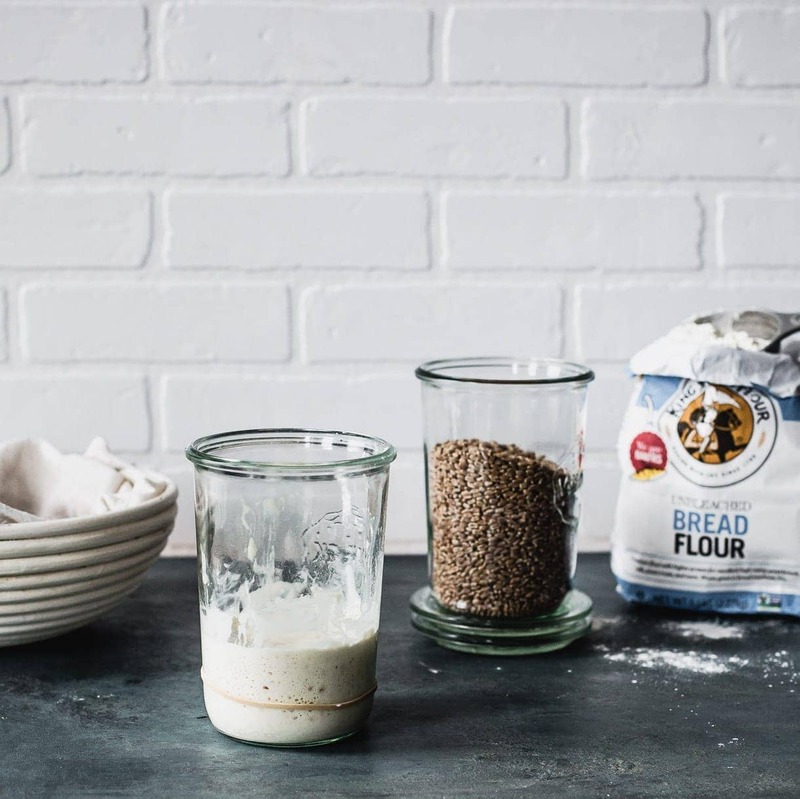 You can certainly create your own starter from just flour and water, using these instructions. However, I found a 100% success rate when using a strong, mature starter from someone else because it already has active cultures present. It eliminates so many variables that often result in starter fails. I purchased mine from Emilie, in a dehydrated form and reactivated it, which she gives instructions for in her book. I’d be happy to share my thriving starter with you too! Just send me an email (amanda@heartbeetkitchen.com) and I’ll get it in the mail for a small fee. 2. What flour do I feed my starter with? Does the water matter too? What about temperature? You should feed your starter with whatever flour it was made from and has been nurtured on, in unbleached form (I use the King Arthur brand). So if that’s rye, you should feed it rye. If it’s all-purpose, you should feed it all-purpose. Yes, the water quality does matter. Make sure it is filtered water, instead of from tap, as this may have chemicals or bacteria that you don’t want harboring in your bread. 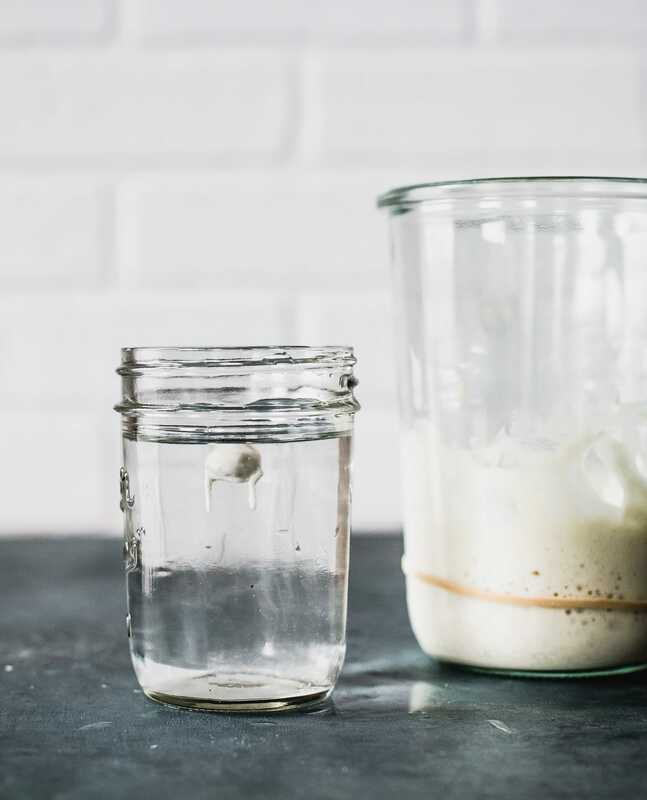 The best temperature for a sourdough starter to thrive is around 73 degrees. I usually put my in the highest shelf in my cabinet, as I know it gets hot up there. If it’s cooler in your house, that’s okay. Just know it will take longer to peak. 3. How often and how much should I feed my starter? Why do I have to discard some of the starter? There are varying thoughts on this. My thought is it all depends on how often you’re baking bread. For me, that’s usually once or twice a week. I feed it once a day, about 20 grams water and 20 grams all-purpose flour, discarding a few tablespoons of starter each time. This is essential for rebalancing the acids. The day before baking, I feed it every 12 hours to really get it activated. Some sources will say that you need to feed it the same amount of water and flour, as the starter weighs. That means if your starter weighs 100 grams, you’ll feed it 100 grams water and 100 grams flour. I ended up with way too much excess starter that way, and found it still performed well when feeding it a lesser amount. Ultimately, the most important thing to focus on is always feeding equal parts flour to water, whatever that number may be. 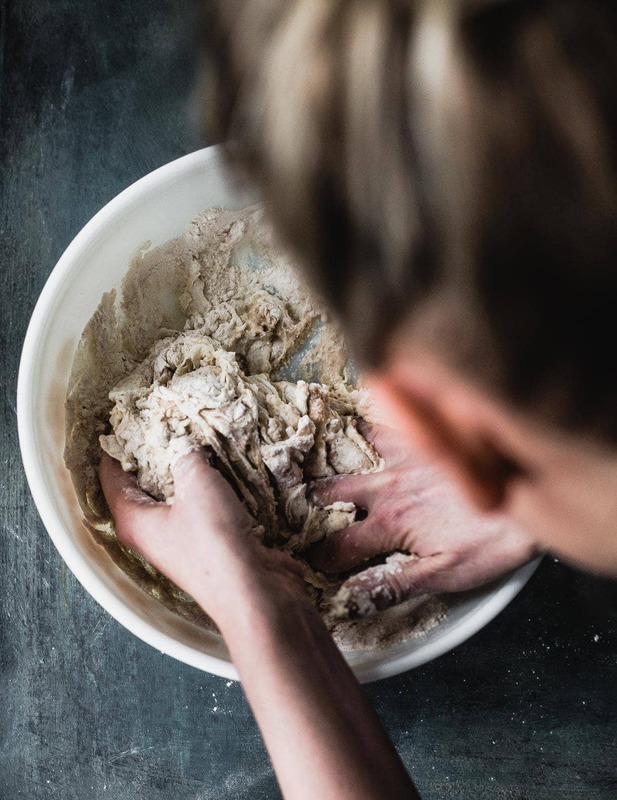 As soon as you feed it the yeast and bacteria in your culture will begin to metabolize the sugars found in the flour, creating gasses as a byproduct. These gasses cause the starter to rise through the day and your dough to rise when baked. 4. How do I know when my starter is active and ready to bake with? Your starter is ready when you take a teaspoon of it, place it in a glass of water, and it floats. Tada! Other signs include when it is doubled in size, which is why I use a rubber band to track the increase in height, and it will have lots of aerated bubbles on top. 5. I travel a lot. Won’t my sourdough die? How can I keep it alive without being able to feed it every day? It won’t die! It’s a myth that it needs to be fed every day, and is actually very resilient. All you need you to do is feed it before you leave, and place it in the refrigerator. It will keep fermenting, but at a much slower pace. When you return home, take it out of the refrigerator and let it warm up for a few hours. Then discard a few tablespoons, and feed it 2x per day, for two days. You should then have an active, bubbly starter. 6. How do I get my loaf to hold it’s shape? I’ve had problems with it spreading too much in the dutch oven while baking. A loaf of sourdough gets its stability and strength from a few sets of “stretch and folds” during bulk fermentation. To keep things clean, you can do this in the bowl itself. You’ll gently stretch the four “sides” of the dough in the air, and fold it over the top. Here is a helpful illustration. I do three sets, the first three hours of bulk fermentation. I find you don’t necessarily have to be precise about the length of time between sets, just make sure you do 3 sets. 7. What are the bare minimum tools I need to get started? With those three things, you can make sourdough! Then as you get more experience, I would recommend these tools to make baking sourdough easier, and prettier. 8. I’ve heard there’s a lot of waste because you discard some of the starter every time you feed it. Is there anyway to avoid this, or use it in another recipe? Certain techniques (like Tartine) have you really build up the amount of starter because they use a higher amount in the recipes. That’s not the case when learning from Artisan Sourdough Made Simple, just one of the reasons why I love it. For most of the recipes, you’ll only need 1/4 to 1/2 cup starter. That means you won’t be discarding a ton of it either. The little bit you discard each day before feeding can be kept in the refrigerator and used to make these pancakes. They’re amazing! 9. There are only two of us in the household. Are there small batch recipes out there? Definitely! This is another reason I recommend learning from Emilie’s book. Her recipes are the only ones I’ve made (the one you see in these photos is the Whole Wheat recipe from the book), and yield one loaf rather than two, like many schools of thought teach (again, Tartine). Having just one loaf allows me to bake more, and try new recipes often. It also keeps the cost down, using less flour. 10. I see sources that talk about a “baker’s schedule”. It seems like a lot of planning, and I’m not sure I’m ready to commit to that. 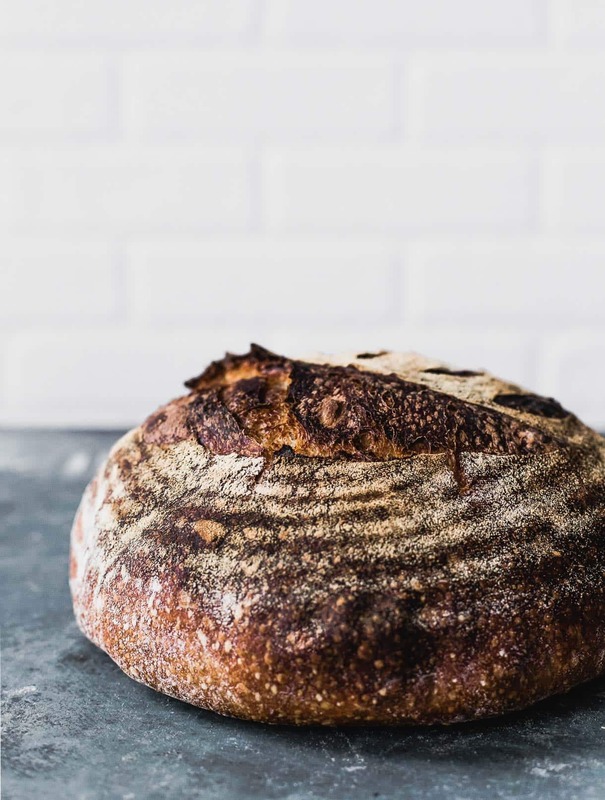 Yes, sourdough baking takes a little bit of planning simply because the bulk fermentation takes about 6-8 hours. But the nice thing is you can let the second rise happen slowly in the refrigerator. So what I typically do is feed my starter in the morning, let it rise. When it’s ready to bake (usually around 3pm), then I mix and do the bulk fermentation. That usually ends around 10pm when I’m headed to bed. So I shape the dough, put it in the refrigerator, and bake it when I get up! I know that’s a lot of information to digest, but hopefully it helped answer some of your questions. And I’m certainly not an expert. I learn something every time I bake another loaf! But don’t hesitate to start. 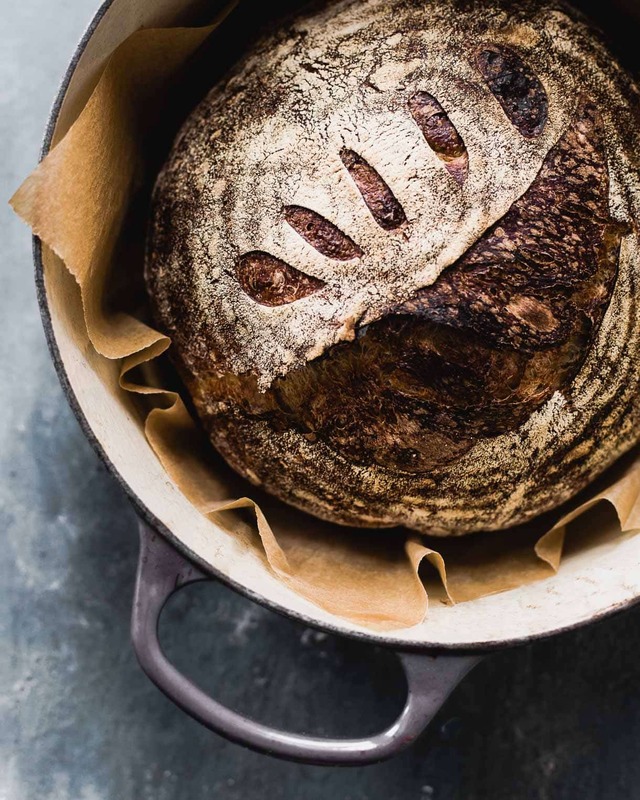 Acquire a starter, the book, and prepare to be amazed at the bread coming out of your kitchen. I will continue to share more topics here and also on Instagram, so be sure to follow me there. And if there is something specific I didn’t get to in this post, leave me a comment and I’ll be sure to answer. Yes, I’ll be sharing a whole wheat sourdough recipe later this week! This is so fascinating! I have to say that as a baker, I haven’t EVER tackled a sourdough starter, eek! I feel much less scared to now that I’ve read all these tips! Thanks for this information! I really love sourdough and miss it since going gluten free several years ago. I’m not sure if I’m brave enough to try it gluten again, but maybe rye would be the best way to reintroduce it, since it naturally has less gluten than wheat? I would also love the recipe for the pancakes you mentioned, but the link isn’t sending me to them, for some reason. 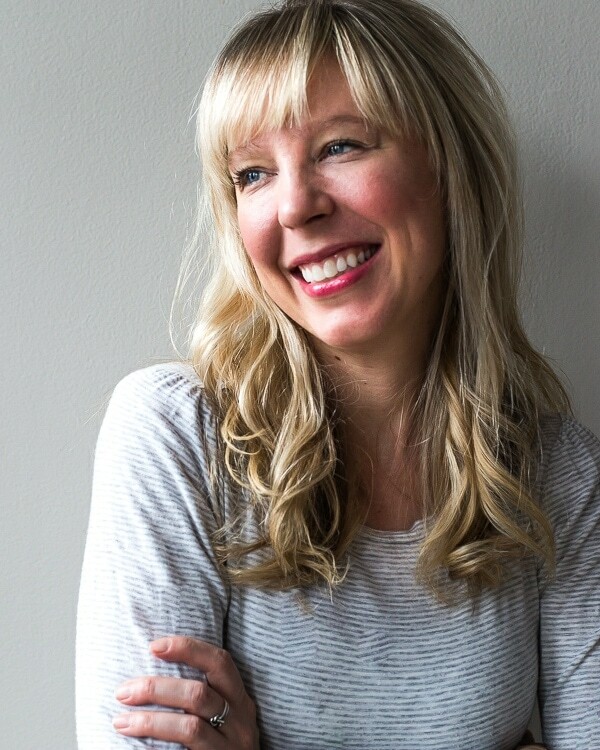 Hi Laura! Yes, I think rye would be a good place to start. A rye starter is similar to creating a regular one. This has a great tutorial for that: https://www.theperfectloaf.com/7-easy-steps-making-incredible-sourdough-starter-scratch/. Also, I fixed the link to the pancakes! This is a great post Amanda! I’ve been making sourdough for many years, starting with Nancy Silverton’s method, then later the one from Tartine. I also was lucky to reactive some of Emilie’s starter recently and I’m back to the bread making ritual. It really is so satisfying to make a loaf of crusty bread, not to mention a million times more delicious and wholesome than most of what you can buy.